Budgies—also called parakeets and budgerigars—are bright, sociable birds who want to be friends, but find humans very large and scary. Hand-training your budgie involves teaching him to step onto your finger, and to remain calm when touched. Once your budgie feels confident perched on your finger, it becomes much easier to bond with him and to check him over for signs of illness. Patience, calmness, repetition and rewards are essential elements of hand-training budgies. Wait a week or two before you start training if your budgie is new to your household, so he can become familiar with his surroundings and settle in. Keep him in a quiet room and protect him from loud noises and sudden movements that may startle him. Talk to him in a soothing tone of voice and repeat his name frequently. Familiarize your budgie with the look and presence of your hand. Give him treats by placing them in his cage and and keep your hand there for two or three seconds before removing it. Also place your hand on the outside of his cage slowly, two or three times a day. Hold a treat inside your budgie's cage when he shows no signs of fear of your hand. If he approaches your hand to eat, he's ready for the next stage of hand-training. Get his feathers clipped by a veterinarian. Begin training sessions, which should last no longer than ten minutes, two or three times a day. Close all doors and other escape routes. Lock doors if there is any chance you'll be disturbed. Holding a thin towel or washcloth, open your budgie's cage; then slowly reach inside and wrap him gently in the towel. Remove him from his cage. Talk quietly and soothingly to him throughout. Sit down on the floor, with your back supported by a wall or furniture. Unwrap your budgie and place him on one of your raised knees. When he flutters off, pick up him up carefully and replace him. Eventually he should perch on your knee and not try to escape. Begin moving your hand slowly towards your budgie by sliding it up your knee. Offer him a small treat to encourage him to feel pleased when he sees your hand. Once he doesn't try to get away from your hand, he's ready to learn how to step up. Hold your finger sideways like a perch and push gently against your budgie's chest. He will lose balance and either flutter away or step onto your finger. Repeat the command "Step up" each time you try. It may take four or five days of sessions for him to learn how to step onto your finger. As a last resort, place your hand on your knee and put him on your finger with your other hand. Talk calmly and reward all progress with small treats. 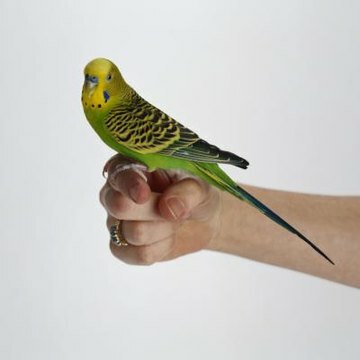 Move hand-training to your budgie's cage once he's learned to step up onto your finger. To take him out of his cage, push gently on his chest with your outstretched finger and give the command "Step up." Eventually he should learn to step onto your finger with only the voice command.  Young birds train more quickly than older ones, so start training your budgie as soon as he's settled in at home.  Untamed, parent-reared budgies may take longer to train.  If your budgie bites, try not to move your hand away, or he may learn to bite to make you leave him alone. ⚠ Don't wear gloves, as your budgie may find them frightening. ⚠ Don't squeeze your budgies' chest. Birds cannot breathe with pressure on their chests. ⚠ Never hit or shout at your budgie. This is harmful and cruel.